Brenda Fyfe, dean of the School of Education, has announced her retirement at the end of 2017. Webster University School of Education Dean Brenda Fyfe has been a major influencer on education in St. Louis. During her 35 years at Webster – the past 15 as dean - she helped attract millions of dollars in grants for community-based educational partnerships that have started programs both at the University and numerous local school districts. During her tenure as dean, she oversaw and supported the re-design of MAT programs, the development of several new master’s degree programs, and a doctoral program to meet emerging needs. She led the school in becoming one of the top educational institutions for preparing educators in teaching English as a second language for children and adults. But her largest influence has been on how several school districts and private schools in St. Louis approach early childhood education. Fyfe has tirelessly advocated for Reggio Emilia Education, a European-style of pre-school education that encourages children to explore and test the boundaries of their knowledge. Today, dozens of early childhood programs throughout the region now offer Reggio Emilia inspired education, and Fyfe is recognized as one of the foremost experts in the country on the educational approach. This year, Dean Fyfe announced her retirement. Fyfe is well known throughout the St. Louis educational community for her work in helping school districts adopt the Emilia Reggio philosophy. As early as 1991, Fyfe was recognized by local media for her work in introducing Emilia Reggio to St. Louis and more recently in 2007 for her efforts to bring this approach to the Early Childhood Education Center in Maplewood-Richmond Heights School District. She also helped establish similar programs at numerous Head Start programs, public school districts and private in St. Louis, Clayton, University City. and Webster Groves. Outside of the region, Fyfe established a collaborative research and education partnership with Reggio Children, the Preschools and Infant Toddler Centers of Reggio Emilia, Italy, and the University of Modena and Reggio. She also serves on the North American Reggio Emilia Alliance national board of directors, as well as on the board for the Association for Constructivist Teaching and for the Educational Deans for Justice and Equity. She previously served on the editorial boards of several publications that discussed early education or Reggio Emilia. 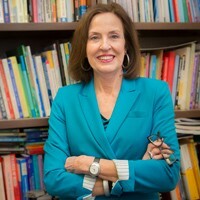 She has contributed to nine books about childhood education, has been interviewed by the authors of two books that focus on Reggio Emilia education, has written several dozen research papers on early childhood education, delivered keynote speeches at four national conferences, and presented research at 12 national and international conferences. During her tenure as dean, the School of Education secured millions of dollars in grants and donations for specific educational programs. Among the largest were a $2.7 million state grant to allow 120 St. Louis area public school teachers in three regional school districts to complete the coursework required by Missouri’s Department of Elementary and Secondary Education for English Language Learner (ELL) Certification, a $1.9 million Department of Education grant to provide provided ELL Certification coursework to more than 80 public school teachers in Kansas City, and a two-year, $1 million grant from the PNC Foundation for the project “Mind Full of Words,” designed to help build preschool children’s vocabularies in two St. Louis low-income neighborhoods. The School also secured a $300,000 state Math and Science Partnership Grant to cross-train K-5 Math teachers in St. Louis to serve the needs of ELLs. In 1999, Fyfe secured a $2.8 million endowment Gift from Beatrice Kornblum, which was used to establish the Kornblum Institute for Teaching Excellence, which awards scholarships, funds professional development, research and special projects focused on urban education. Just this month, she announced the School received a $300,000 grant from PNC Bank to extend the original $1 million grant for “Mind Full of Words” for a third year. As dean, she oversaw and supported the re-design of five Master’s in Teaching degree programs, oversaw the development or redesigned 10 other master’s programs, and helped create a doctoral program. She led the school to achieve national accreditation from the National Council for Accreditation in Techer Education (NCATE). In addition, seven graduate programs in the school have achieved additional national recognition through accreditation by special professional associations. During her tenure, the School of Education established professional development partnerships and corporate partnerships with Maplewood Richmond Heights School District, University City School District, Webster Groves School District and Special School District. Fyfe’s last day will be Dec. 31. The University has announced that Thomas Cornell, associate professor and chair of the Language, Literacy, and Leadership Department, has been named interim dean of the School of Education. DJ Kaiser, associate professor and program director for the MA in Teaching English as a Second Language, has been named associate dean on an interim basis.